I’m a firm believer in the saying: when you know what you love, get it in every color. As for me and drop waist dresses? It was one of those love at first sight feelings. I wore my first last week in navy and knew I would adore it just as much in red. Spoiler alert: I was right. Just add a cozy knit moto jacket and you basically have my uniform for the rest of the season. I’m impressed at how good you look in a dropped waist – I’m short too, so I know they can often look frumpy! But you look awesome. Love the accessories too. I’m not a big fan of drop-waist dressed but you rocked it! 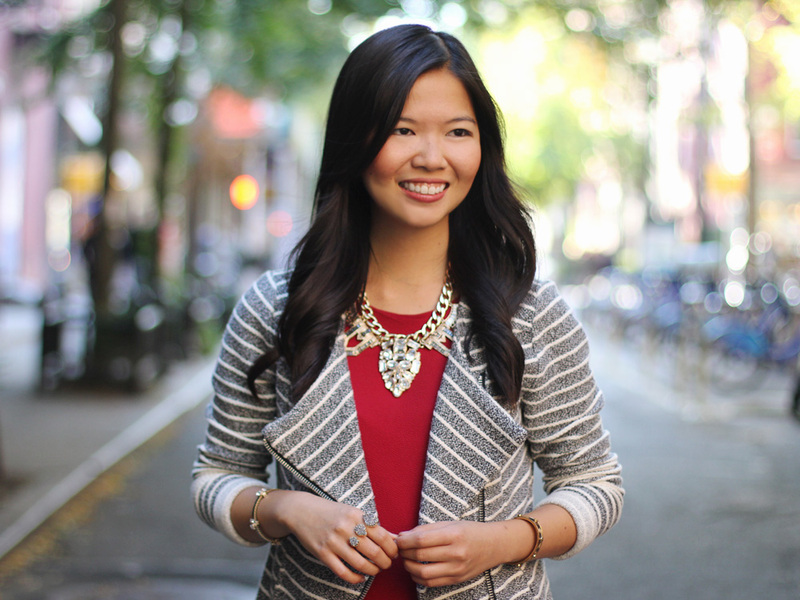 I love the addition of blazer and statement necklace. 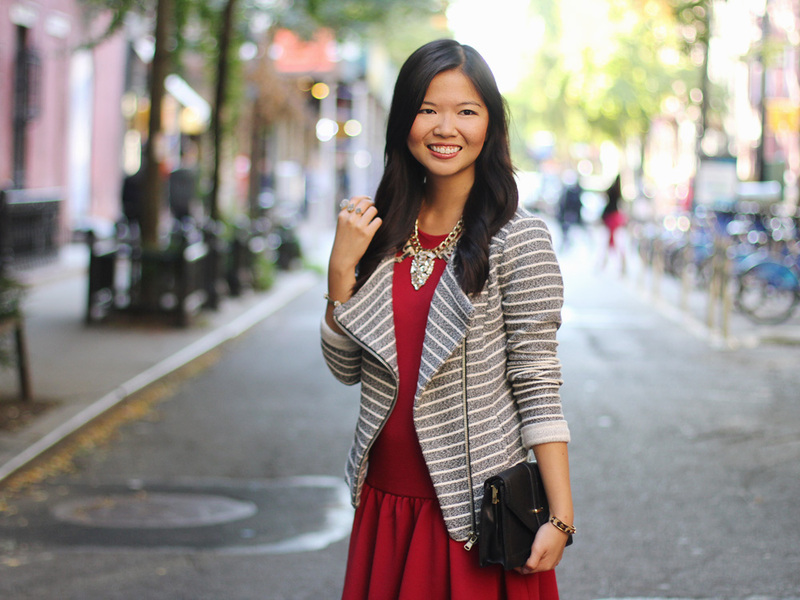 Love the Lou & Grey jacket paired with the red. Have a great Monday! Love that red dress! Great color on you! This is such a great silhouette on you! Love the jacket too. I love drop-waist dresses- this one fits you perfectly! I have to admit that I’m not the biggest fan of drop waist dresses, but I do love your jacket! The red is great on you! This is a great way to wear the drop waist! I’m terrified of them making me look shorter, but the cut of the blazer looks great on it. I’m seriously so obsessed with this outfit! That dress would be the perfect holiday dress!! It looks stunning on you! I love the drop waist dress! That necklace brings the whole outfit together..love it! You look AWESOME in red 🙂 I love the accessories in the outfit and how chic and feminine it is!! The styling is awesome – young, trendy, and chic! Love the fit of this dress! You styled it perfectly! Those shoes are amazing! And I love the color of your dress! Great pics! Love your shoes, it’s so elegant. The red dress is also nice. Cute and feminine. This is a great dress! I love the statement necklace you paired with it. This color is perfect on you! 🙂 Loving this statement necklace too!